Kristen Horgan Smith can get a little impatient at times, but you won’t catch her teammates complaining. The game was only two-minutes old when the third-year midfielder for the women’s soccer team flew up the field and launched the ball past the goalkeeper for an early 1-0 lead. 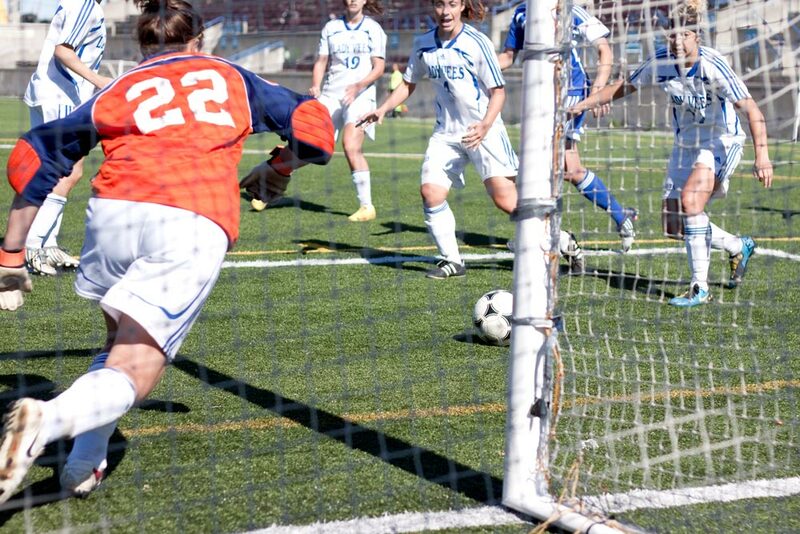 Her solo effort would stand as the game-winner and the team snatched their second win of the season over the Laurentian Lady Vees on Saturday at Lamport Stadium. Horgan Smith said the goal came down to good decision-making on her part. Both Laurentian University and Ryerson pushed a strong offensive strategy and neither team was able to dominate. The players were locked in a fierce competition for ball possession the entire game. The aggressiveness of the game reached its peak when Laurentian forward Cailey Robertson landed hard during a battle for the ball in the second half and was on the ground for nearly 10 minutes before leaving on a stretcher. When the drama was over, both teams picked up right where they left off. Ryerson was unable to get the ball in close to the net for high-percentage opportunities and their opponents didn’t fare much better. Mohammadi is pleased with the team’s improvement since they last squared off against Laurentian to open their season. “We changed the formation of the system we play. We worked a lot more on our offensive side as the other team is more defensive, so we came out and scored more goals,” said Mohammadi. With this win, Ryerson sits seventh in the standings. Their next game is against Toronto on Sunday, Oct. 13 at Lamport Stadium.